Despite diplomatic efforts by Israel and US, UN tourism organization set to approve PA acceptance as full member. 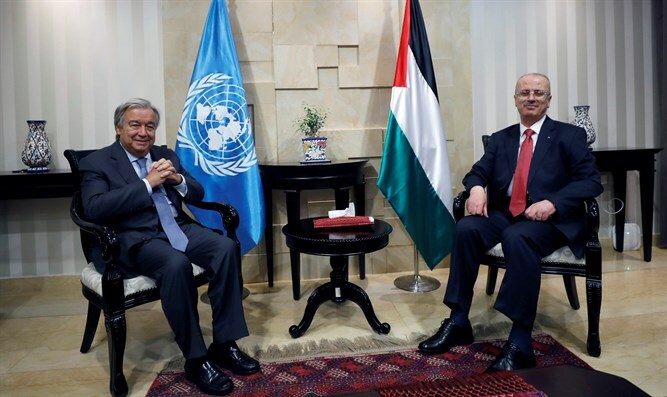 Israel is attempting to exert recent diplomatic pressure to prevent the Palestinian Authority from becoming a full member of the UNWTO UN tourism organization. Some of Israel's friends, especially the United States, have exerted heavy pressure in recent days on the PA to withdraw their application to the organization, and have also used the claim that the PA is not a declared state, thereby precluding the possibility of winning organization membership. However, a senior Foreign Ministry official told Arutz Sheva that "it seems that the chances of the decision coming off the agenda are very low, and unfortunately we are expected to see an Israeli defeat in this vote." The Foreign Affairs Ministry estimates that preventing the PA move is impossible, against the background of the latest report issued by the UN Tourism Organization. According to the document published a few days ago, the PA was listed as the world's most expanding tourism country, with the organization claiming a 57.8 percent increase in the number of tourists visiting. In Israel, the organization identified a 25.1 percent tourism increase. In recent years, the PA has expended tremendous effort fighting Israel in the UN arena, including through membership in various organizations with the aim of attacking Israel once they gain membership, one of which is the PA and their supporters joining of the United Nations Educational, Scientific and Cultural Organization (UNESCO).